When this monster is Normal Summoned, Flip Summoned or Special Summoned, select 1 face-up monster on the field and decrease its ATK by 800 points. This effect lasts until the selected card is destroye.. While this card is on the field, it is unaffected by the effects Spell Cards. During your Standby Phase, by sending this face-up card to the Graveyard to Special Summon 1 "Ultimate Insect LV3" from yo.. 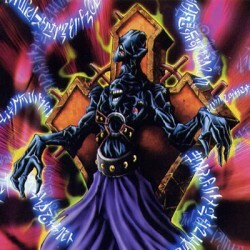 When this card has been sent to the Graveyard as a result of battle, this card's effect is activated. As long as this card exists in the Graveyard, your opponent discards 1 card randomly from his/her ..
Control of this card cannot switch. During the End Phase of a turn that this card destroyed a monster as a result of battle, by sending this card to the Graveyard to Special Summon 1 "Horus the Black .. While this card is on the field, it is unaffected by Spell Cards. During the End Phase of a turn that this card destroyed a monster as a result of battle, by sending this card to the Graveyard, Specia..